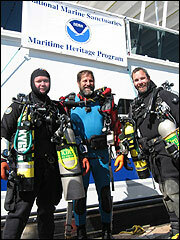 From February 19-March 5, 2006, the Maritime Heritage Program's Tane Casserley, Thunder Bay National Marine Sanctuary's Russ Green and the NOAA Dive Center's Bill Gordon joined the National Park Service's Submerged Resources Center (SRC) for a project in Nevada and Arizona. Led by the SRC's Dave Conlin and Brett Seymour the project's goal was to aid in the documentation of two historic sites within the Lake Mead National Recreational Area. The first site was an aggregate plant that was used in the construction of the Hoover Dam and later submerged after the dam's completion in 1935. The second site was a B-29 Superfortress bomber that crashed into the lake in 1948 after testing a prototype missile guidance system known as a "suntracker." The B-29 is in extraordinary condition and the fact that it is submerged in cold, fresh water will hopefully ensure this excellent state of preservation long into the future. Both sites are in the final stages of documentation and the National Park Service is planning to open them to the public in the near future. The Lake Mead B-29, designated B-29 45-21847, was one of the last of over 1,620 B-29's built for the U.S. Army at the Boeing plant in Wichita, Kansas. As part of the last B-29 production run the bomber was delivered eleven days after the surrender of Japan on September 13th, 1945. In 1947 the plane had its defensive armament removed and was designated as a reconnaissance plane. Later that year the B-29 was transferred to the Upper Atmospheric Research Project 288 at Muroc Army Airfield, now Edwards Airforce Base (Rodgers Dry Lake). Upper Atmospheric Research Project 288 was created to gather basic information about the upper atmosphere at the beginning of the cold war to aid in developing intercontinental ballistic missiles. Part of this research was focused on the development of a device that used the sun as a point of reference to guide missiles as the arched from the United States towards the Soviet Union. 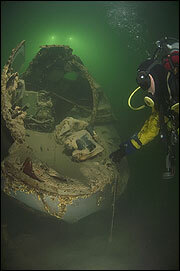 While testing the device known as a "suntracker" the B-29 crashed into Lake Mead on the morning of July 21, 1948. As the plane descended over Lake Mead, the pilot reportedly lost depth perception above the lake's smooth surface. The huge bomber hit the water at an indicated airspeed of 230 miles per hour. 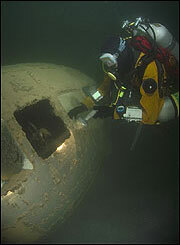 The contact with the lake immediately tore three of the four engines off the plane. The pilot managed to wrestle the bomber back into the air and then ditch; all members of the crew managed to get out alive before the B-29 sank. The aggregate plant and the B-29 offered unique opportunities for the MHP to work with its sister organization in the National Park Service. The two groups have worked closely before, most recently on the Japanese midget submarine off Pearl Harbor, but this is the first collaboration diving on a deep archaeological site. This partnership is especially significant because the National Marine Sanctuaries MHP and the National Park Service's SRC are the only two organizations within the Federal Archaeological Program that routinely use technical diving to document deep water sites. Operating at a depth of 140 feet and 170 feet, the dive team utilized mixed gas diving techniques. 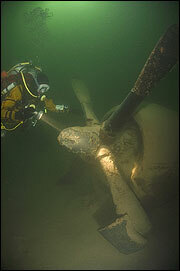 The NOAA divers used traditional SCUBA, while the National Park Service archaeologists used closed-circuit rebreathers. Weighing significantly less and using gas more efficiently, the rebreathers allowed for a greater bottom time and increased margin of safety. This project afforded the MHP, as well as the NOAA Dive Center, an opportunity to observe this technology during field work in a remote location. A portable recompression chamber and operator provided by the NOAA Dive Center was also on-site during the project. The growing partnership between the MHP and the SRC can only help to strengthen the Federal Archaeological Program. This project is only one of several collaborations between MHP and the SRC planned this year. Stay tuned!